A Charity Evening is being organised by The Lions in aid of The "Jonathan Brook" wheelchair appeal. The event is being held at The Wesham Community Centre on Sat 19th April and this is in conjunction with the celebration of the 25th anniversary of the Community Centre. Jonathan Brook lives in Kirkham and is a young man who is in desperate need of a special type of wheelchair which will cost in the region of £8,000. The tickets are only £5-00 each and this is to include an "Hot Pot" supper. You will also get £15,000 of "Funny Money" to gamble. Further details and tickets are available from Cllr Geoff Dixon; Telephone 01772 686504 or by contacting any Wesham Town Councillor (For contact details click here). At the recent Wesham Town Council meeting, held on Tuesday 24th March 2008, Cllr Michael Devaney was unanimously voted to be the Mayor of Medlar with Wesham for 2008/2009. Cllr Mrs Linda Nulty was elected as Deputy Mayor. The hand over from the current Mayor , Cllr David Ogden will be at the annual 'Mayoral Installation' meeting on May 20th. The annual Parish Meeting for all Medlar with Wesham Residents will be at 7 pm on Tuesday April 29th followed by the normal Town Council meeting at 7.30pm. 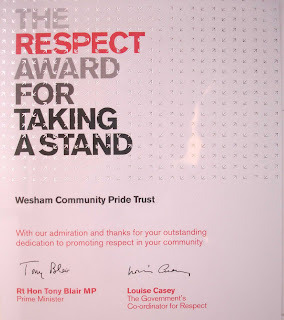 Wesham Community Pride Trust were delighted to be nominated for a Respect award in 2007 following their involvement with the 2006 Operation Cleansweep. WCPT are again offering their help in support of Medlar with Wesham Town Council. The initiative has already been discussed with officers at Fylde Borough Council who have offered resources. The final arrangements are to be discussed at the the next Wesham Town Council Meeting. If you would like to volunteer to help to improve the appearance of Wesham please e-mail WCPT at the feedback panel at the bottom of this page. A public meeting called by the Mayor of Kirkham, Cllr Liz Oades on Tuesday 19th March was held to investigate how the baths can be run after the 1 year period of grace offered by Fylde Borough Council. At a packed meeting at the Kirkham Community Centre outlines of a plan drawn up by Cllr Liz Oades, Cllr Linda Nulty and Cllr Richard Nulty, to create a Trust were put forward by Cllr Oades. The plan was supported by the Chairman of the Friends of Kirkham Baths, Raymond Green. Various options for the funding were discussed including the support from Parish Councils. Wesham Town Council indicated their support and several other Councillors agreed to report back to their respective Councils' seeking their agreement. It was indicated that Fylde Borough Council would be "minded" to pay a subsidy during the set up period. It was made clear to the meeting that a large sum of money would be needed annually to maintain the operation of the baths but if successful it would remove the annual uncertainty of possible closure. The concept of donations/subscriptions/fund raising were discussed and in general, support was expressed. Councillor Oades and fellow Councillor Elaine Silverwood were delighted at the expressions of support from the meeting....Mr Green added that he thought the proceedings were "very positive". With the aim of taking the plan forward to form a Trust, around 12 members of the public volunteered to be part of the process. A resident of Kirkham, who was part of the organisation team who arranged for the protest march, was also delighted with the progress and said "I think the idea of a trust is definately the way forward." It was agreed that as much publicity as possible should be given to the proposals in order to encourage residents to consider supporting financially. Further plans will be put forward after various legal issues concerning covenants and leases have been checked over. It is intended to create a 'KirkhamBaths' stand alone website. The necessary arrangements are currently being worked on. 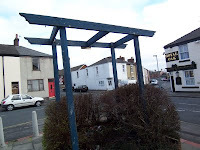 Once established, links will be set up to and from http://www.wesham.org.uk/ and the Wesham billboard. On Sunday 16th March 2008, The Politics Show , covered an item about the closure of swimming pools , in particular, St Annes baths. During the presentation a very eloquent young lady (aged 13) was interviewed when she expressed her concern at the closure of the baths and made reference to a web site she has constructed. A Public Meeting, arranged by the 'Friends of Kirkham Baths', is to be held on Tuesday 18th March 2008 at 7.30pm at KIRKHAM COMMUNITY CENTRE. The purpose of the meeting is to create a committee to research funding streams and best practice on pool management to prepare for any further cuts in Council Funding. Representatives from Parish Councils and members of the public are invited to attend. The next Wesham Community Pride Trust meeting will be held on March 26th 2008. Committee members will be informed of the Agenda in due course. We have recently been reminded that attention is required at the Everest Court Pergola. I am pleased to report that this item along with a number of other projects are already included on a rolling work programme for the summer months. We, the WCPT, are most grateful to the Probation Service who have agreed to help us and include this and many other projects in this years' programme. During the winter months the Probation Service have removed all the wooden benches from the Town and they have been painted and repaired as necessary. The benches are scheduled to be replaced in the next few weeks. The recent crisis with the closure of the St Annes pool has galvanised many people from Kirkham, Wesham and St Annes into questionning the cabinet's decision. If you are frustrated by the current situation then this site can be used to express your feelings. "If you govern without the consent of the people, they will, eventually, rise up and revolt against you". A High Performing Council ??? For A Link Not to be missed click here ! Despite the best endeavours of the Public and Opposition Councillors, the Conservative group have decided to close St Annes swimming baths. The Independent Group fought valiantly at last nights' Borough Council meeting to save BOTH of the pools. Despite submitting several workable amendments with sensible budget rearrangements, to save both pools, the Conservative group were having none of it and were determined to implement their amendment (delivered only 5 minutes before the meeting) to keep Kirkham open but to close St Annes. Whilst Kirkham will remain open it must be remembered that this is just "a stay of execution" as stated by a cabinet member. No doubt this stay of execution will remain in place until after the County elections next year! Feelings ran high from the (enforced limited) number of members of the public who described the proposition put by the ruling group, as being "shameful". 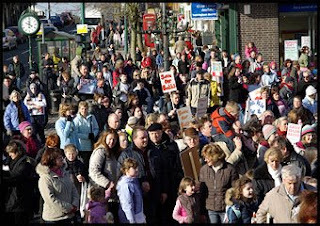 Protestors claimed that the only reason that Kirkham was saved was because of the County Council elections in 2009. Throughout the 5 hour proceedings, the public enthusiastically applauded the amendments put by opposition Councillors, to try and save the St Annes pool as well as Kirkham's pool. A spontaneous roar of approval was heard by the public when there was a vote of no confidence of Cllrs Coombes, Rigby and Ashton on the grounds of total mismanagement of the budget. No such applause or sounds of approval was ever heard for any speeches made by the ruling group. Indeed the Mayor had to call a temporary halt to the meeting because the public felt so strongly against what was being suggested by the Cabinet members. They made vocal comments to indicate their anger. At the times of voting, which became a predictable outcome, sounds of "baah baah" was overwhelming each time the conservative group raised their hands in unison. It was also extremely noticeable that hardly any conservative Councillor, other than the Cabinet, made any comment throughout the 5 hours, clearly it was "a done deal". The majority party were able to win at every stage demonstrating a severe lack of democracy with this appalling cabinet system. The cabinet members certainly capitalised on their position......it is said that a picture counts for a thousand words! Put your own interpretation on the picture! 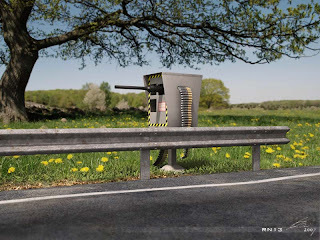 If the Speed Indicator Device currently being installed at various sites in Wesham, fails to reduce traffic speeds on our Roads, then I am planning to arrange for the latest 'Deluxe' (Look Closely! )version to be permanently fitted. Kirkham and Wesham was on Saturday morning (March 1st) witness to an overwhelming display of support from residents from Kirkham, Wesham and the surrounding Parishes. The march was organised to make their feelings known to the ruling group at Fylde Borough Council of their concern for the current proposal for the two swimming pools to be closed, to plug the £1.2M defecit. The cabinet have already voted in favour of closing the baths but the final decision is to be made on Monday 3rd March at a meeting to be held at 5pm at the Fylde Rugby Club premises. The opposition group led by Cllr Liz Oades are ready to propose an alternative budget which they are hoping will save the pools. Residents are encouraged to attend the meeting at Fylde Rugby Club to further indicate to Fylde Borough Councillors their concern. 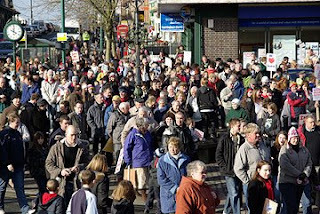 Today's march commenced at 10.00am at the Market Square and made its' way to Wesham before returning to the Market Square.. The crowds stretched as far as the eye could see and organisers and local Councillors were delighted by the strength of support. Special thanks MUST be made to our local Police Officers for the excellent support and handling of the march, which they provided in their own time. Overall it was an excellent display of the Community Spirit enjoyed between the two towns to send a message to Fylde Borough Councillors, in particular the Cabinet and the ruling group. and for more information visit the Blackpool Gazette's Report by clicking here.